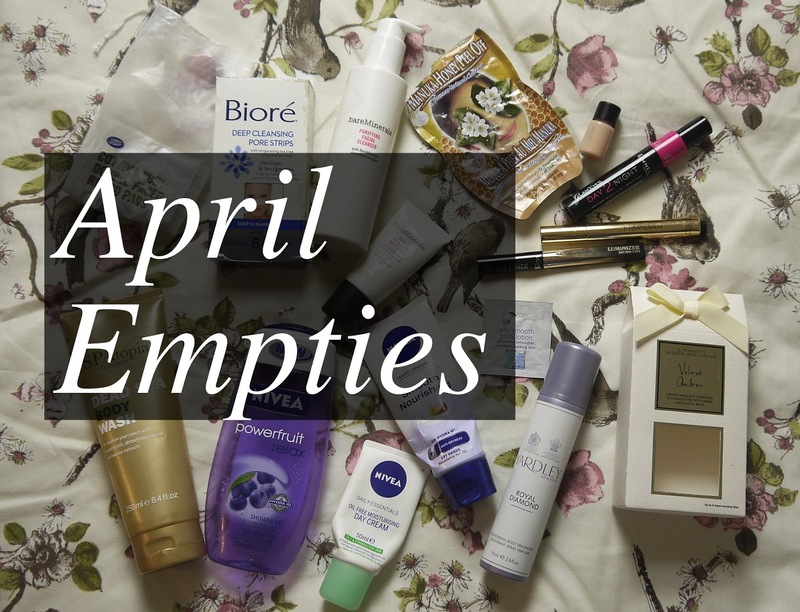 I’ve only a handful of items this month, but there are empty makeup items again! We finished up a SPAtopia dead sea body wash (it was a free gift with purchase). This was fine, it wasn’t overly drying but it was only average, I don’t think I’ll be rushing out to purchase it. Also finished up a Nivea powerfruit body wash. This ended up irritating my skin a wee bit – it was fine for my OH though, so this could work for you. I won’t be repurchasing. Now for creams, I have an empty Nivea Day Cream for Oily/Combination skin. This became a neck cream for me as it stopped working so well for my face. I would still recommend this and I may try it again in the summer. It’s lovely and light, reasonably priced and didn’t irritate my skin. I’ve finished yet another hand cream, the Nivea Smooth Nourishing hand cream for dry hands. I really liked this and I will likely repurchase in the future. I’m a fan of the Nivea hand creams. I had a tiny sample of spa silky smooth body lotion. I’m not even sure of the brand here, it was 1ml sample so as you can imagine I didn’t get much use out of it and won’t be tracking it down. I also finished up a box of the Velvet Amber tealights. I got these on offer from Sainsburys just after Valentines or Mother’s Day, they’re not available any more. They were lovely, I only needed to burn a single tealight and it really scented the room. Now on to the face products! Skin care first. Unsurprisingly I’ve used up some cotton rounds. These are just boots own brand, they work fine and I’ve already repurchased. I’ve also finished up a box of the Bioré Deep Cleansing Pore Strips. These do work if you have serious blackheads, mine just aren’t big enough for this to be effective. From bareMinerals I’ve finally used up the Purifying Facial Cleanser, I’ve had this for such a long time. I used to use this religiously and it did work really well when I first used it and for about a year. My skin has changed and this isn’t my favourite cleanser any more, it’s a wee bit drying. I won’t be repurchasing for now – I still have a travel size so I can always use that in a few months when my skin is oilier if I fancy. I have finished a travel size of bareMinerals Purely Nourishing Moisturiser for combination skin. I used this as a day cream and it works fine – similar to the cleanser, it used to work better. I still have another travel size of this left, so I won’t be repuchasing for now. I tested out a Montagne Jeunesse Manuka Honey Peel Off face mask. This didn’t really do anything for me, so I won’t be repurchasing for now. Finally for makeup! It makes me very sad to say that my YSL Touché Eclat. It was really past it’s use by date and wasn’t the best to use anymore. I won’t be repurchasing for now but I will in future probably! I’ve decided to get rid of an eyeliner from L’Oreal, the luminizer for brown eyes. I wasn’t the biggest fan of this liquid liner, the foam tip just didn’t do it for me. I’m sad to be throwing out my Rimmel GlamEyes Day 2 Night mascara in brown/black. I love this mascara, I always used the volume brush and it gave great volume and length to my lashes which keeping them nicely separated. I will likely repurchase in the future – I just have a massive stash of mascaras for now! The last item is a Estée Lauder Double Wear sample. I’ve already talked about this foundation in this review post. I did really like it and I may buy it in future, again I’ve a stash of foundations to get through – including another sample of this foundation! So that’s it, if you want a closer look at any of the products you can check out the video down below.